Nontuberculous mycobacteria (NTM), an extremely diverse group with a wide spectrum of virulence, appear to be rising in prevalence. This may be due to both increased awareness and improved diagnosis, among other factors. Most NTM-pulmonary disease (NTM-PD) infections are caused by the slow growing Mycobacterium avium complex (MAC) however, other species can also cause pulmonary disease including M. abscessus, M. xenopi, M. malmoense and M. kansasii. Symptoms of NTM-PD vary considerably and may include chronic cough, with or without sputum production or haemoptysis. Treatment options are limited at present and associated with significant intolerance, treatment failures and drug–drug interactions. Further prospective studies are needed to define suitable drug regimens for different NTM species and to improve knowledge of the natural history and epidemiology of NTM-PD. Michael R Loebinger has received consultancy fees from Insmed, but this has not impacted on the article. Tobias Welte has received consultancy fees from Insmed, but this has not impacted on the article. The publication of this article was supported by Insmed. The views and opinions expressed are those of the authors and not necessarily those of Insmed. 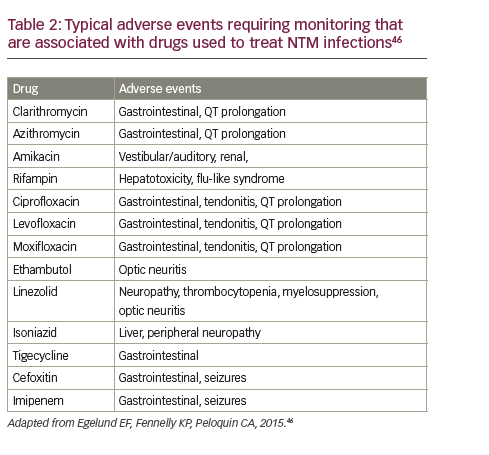 NTM are treated with antimicrobial chemotherapy, however treatment response is often poor, and side effects significant. 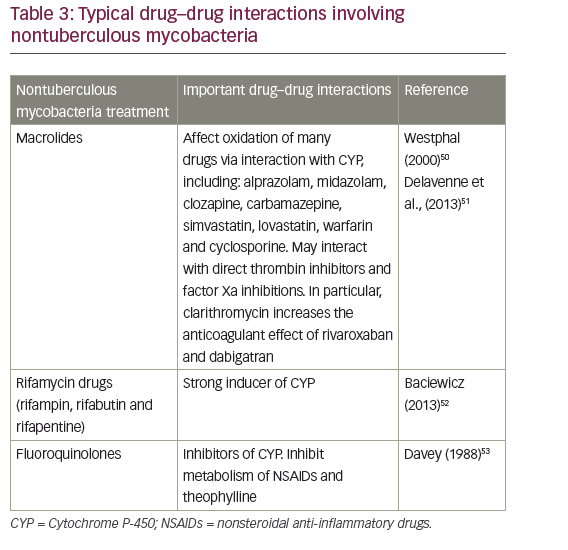 Deciding which mycobacteria and patients to treat, and when, and the assessment of response to treatment is very difficult. The purpose of this review is to provide a succinct summary of issues surrounding the epidemiology, diagnosis and treatment of NTM-PD. In contrast to tuberculosis, NTM isolation in pulmonary specimens does not necessarily equate with active pulmonary disease, thus the incidence and prevalence of NTM pulmonary infections is difficult to characterise accurately.9 In addition, unlike tuberculosis, isolating NTM does not constitute a reportable condition in many countries. Population-based data for prevalence are available mainly from the US, Europe, New Zealand and Australia (where NTM isolation is reportable).17 These estimates are based on a mixture of microbiology laboratory reports, medical insurance returns and surveys. Annual prevalence estimates in North America and Australia range from 3.2 to 9.8 per 100,000.17 In Europe the estimates are generally lower, up to 3.3/100,000.17,18 The prevalence is significantly higher in certain regions and patient groups and period prevalence has been put at over 100/100,000 in the over 65-year-olds in the US over an 11-year period.19 The incidence of NTM disease is increasing throughout the world,11,17 with some estimates of an increase of 8.2% per year19 NTM-PD is currently more common in the US than tuberculosis.20 Improvements in awareness and diagnosis may in part underlie this rise. Pre-existing chronic lung disease (bronchiectasis, cystic fibrosis, chronic obstructive pulmonary disease [COPD], idiopathic pulmonary fibrosis) predisposes patients to acquiring NTM respiratory infection.26,27 Other disease risk factors include thoracic skeletal abnormalities, taking immunomodulatory drugs and rheumatoid arthritis.17 Clustering of disease within families may suggest a heritable genetic predisposition to susceptibility of NTM-PD. Defects in interleukin-12 and interferon-gamma defence pathways may increase susceptibility to NTM infections28 and these defects have been described both in individuals and in familial clustering of disease.29 A recent study utilising exome sequencing of patients, family members and controls has suggested a multihit, multi-genetic predisposition to NTM disease.30 In addition to host predisposition, environmental exposure is likely to play a significant role in predisposition to NTM-PD, as suggested by variance in prevalence and mortality between and within countries. In studies in the US,19 Japan31 and Australia,32 temperature, humidity and alteration in soil components have impacted on NTM prevalence. associated with progression to deteriorating disease over 5 years.38 In another retrospective analysis, which involved data from 52 adults with non cystic fibrosis bronchiectasis and coexisting MAC infection over a 5-year period, chronic pulmonary aspergillosis and nodules with cavitation and emphysema on high-resolution CT scans at presentation were identified as a strong independent predictors of mortality.39 In a retrospective cohort study of 124 patients with NTM, predominately M. avium, the most important predictor for increased mortality was the radiological appearance of a consolidation.40 Direct comparisons between studies are difficult due to the differences in treatment regimens, patient cohorts and methodologies. Symptoms are variable although chronic cough with or without sputum production or haemoptysis, is common. Other symptoms include fatigue, malaise, dyspnoea, fever, chest pain and weight loss. The evaluation of NTMs is often complicated by coexisting lung diseases including cystic fibrosis, bronchiectasis and pneumoconiosis. For patients in whom diagnosis is not clear, expert consultation should be sought. High resolution CT scans showing NTM-PD are presented in Figure 1.
balanced against a sometimes indolent clinical course. A patient’s comorbidities and quality-of-life issues are also important to take into account. There are currently insufficient data on the natural history of untreated infections to guide clinical decision-making in this respect. In clinical practice it is often difficult to discern whether or not disease progression is due to NTM. 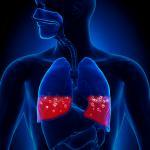 Even if NTM is diagnosed, lung disease treatment may not always be needed. For patients with indolent NTM lung disease there is usually enough time for careful consideration of the optimal management. Once a risk-benefit decision has been made to begin NTM therapy, the choice of agents and duration of treatment is based on the specific organism and extent of disease. Before a decision is made to treat with the aim of improving symptoms such as cough, it should be considered whether the symptoms are attributable to a concomitant diagnoses of bronchiectasis, sinus disease and/or gastroesophageal reflux disease. NTM-PD is increasing in prevalence, leading to an emerging public health problem.17,49 More work is needed to investigate species-specific environmental niches as causes of differences in global isolation patterns.22 Better management of the disease remains an unmet need with improvements required in diagnosis, treatment, patient adherence to treatment and patient outcome. Present treatment options are limited, with drug regimens associated with significant failure and intolerance. Individualised treatment should be administered after careful consideration of both the efficacy and risk of adverse events. New treatments for NTM infections are imperative and more prospective studies are warranted to define suitable drug regimens for different NTM species and to better define the natural history and epidemiology of this condition. Due to the complexity of the problem, involvement of specialist centres is important. 1. Griffith DE, Aksamit T, Brown-Elliott BA, et al., An official ATS/ IDSA statement: diagnosis, treatment, and prevention of nontuberculous mycobacterial diseases, Am J Respir Crit Care Med, 2007;175:367–416. 2. James J Plorde, Mycobacteria. In: KJ Ryan, CG Ray, Sherris Medical Microbiology, 4th Edition: McGraw-Hill Medical, 2004;439–56. 3. Jarlier V, Nikaido H, Mycobacterial cell wall: structure and role in natural resistance to antibiotics, FEMS Microbiol Lett, 1994;123:11–8. 4. Schulze-Robbecke R, Janning B, Fischeder R, Occurrence of mycobacteria in biofilm samples, Tubercle and Lung Disease, 1992;73:141–4. 5. Falkinham JO 3rd, Growth in catheter biofilms and antibiotic resistance of Mycobacterium avium, J Med Microbiol, 2007;56:250–4. 6. Bodmer T, Miltner E, Bermudez LE, Mycobacterium avium resists exposure to the acidic conditions of the stomach, FEMS Microbiol Lett, 2000;182:45–9. 7. Kirschner RA, Jr., Parker BC, Falkinham JO 3rd, Epidemiology of infection by nontuberculous mycobacteria. Mycobacterium avium, Mycobacterium intracellulare, and Mycobacterium scrofulaceum in acid, brown–water swamps of the southeastern United States and their association with environmental variables, Am Rev Respir Dis, 1992;145:271–5. 8. Faria S, Joao I, Jordao L, General overview on nontuberculous mycobacteria, biofilms, and human infection, J Pathog, 2015;2015:809014. 9. Johnson MM, Odell JA, Nontuberculous mycobacterial pulmonary infections, J Thorac Dis, 2014;6:210–20. 10. Tortoli E, Impact of genotypic studies on mycobacterial taxonomy: the new mycobacteria of the 1990s, Clin Microbiol Rev, 2003;16:319–54. 11. Prevots DR, Shaw PA, Strickland D, et al., Nontuberculous mycobacterial lung disease prevalence at four integrated health care delivery systems, Am J Respir Crit Care Med, 2010;182:970–6. 12. van Ingen J, Bendien SA, de Lange WC, et al., Clinical relevance of non-tuberculous mycobacteria isolated in the Nijmegen-Arnhem region, The Netherlands, Thorax, 2009;64:502–6. 13. Cowman S, Burns K, Benson S, et al., The antimicrobial susceptibility of non-tuberculous mycobacteria, J Infect, 2016;72:324–31. 14. Bryant JM, Grogono DM, Greaves D, et al., Whole-genome sequencing to identify transmission of Mycobacterium abscessus between patients with cystic fibrosis: a retrospective cohort study, Lancet, 2013;381:1551–60. 15. Cystic Fibrosis Trust, Cross-infection, 2016. Available at: www. cysticfibrosis.org.uk/life-with-cystic-fibrosis/cross-infection (accessed date: 26 July 2016). 16. Floto RA, Olivier KN, Saiman L, et al., US Cystic Fibrosis Foundation and European Cystic Fibrosis Society consensus recommendations for the management of non-tuberculous mycobacteria in individuals with cystic fibrosis: executive summary, Thorax, 2016;71:88–90. 17. Prevots DR, Marras TK, Epidemiology of human pulmonary infection with nontuberculous mycobacteria: a review, Clin Chest Med, 2015;36:13–34. 18. Ringshausen FC, Wagner D, de Roux A, et al., Prevalence of nontuberculous mycobacterial pulmonary disease, Germany, 2009–2014, Emerg Infect Dis, 2016;22:1102–5. 19. Adjemian J, Olivier KN, Seitz AE, et al., Prevalence of nontuberculous mycobacterial lung disease in U.S. Medicare beneficiaries, Am J Respir Crit Care Med, 2012;185:881–6. 20. Iseman MD, Marras TK, The importance of nontuberculous mycobacterial lung disease, Am J Respir Crit Care Med, 2008;178:999–1000. 21. Marras TK, Daley CL, Epidemiology of human pulmonary infection with nontuberculous mycobacteria, Clin Chest Med, 2002;23:553–67. 22. Hoefsloot W, van Ingen J, Andrejak C, et al., The geographic diversity of nontuberculous mycobacteria isolated from pulmonary samples: an NTM-NET collaborative study, Eur Respir J, 2013;42:1604–13. 23. Adjemian J, Olivier KN, Seitz AE, et al., Spatial clusters of nontuberculous mycobacterial lung disease in the United States, Am J Respir Crit Care Med, 2012;186:553–8. 24. Feazel LM, Baumgartner LK, Peterson KL, et al., Opportunistic pathogens enriched in showerhead biofilms, Proc Natl Acad Sci U S A, 2009;106:16393–9. 25. Thomson RM, Changing epidemiology of pulmonary nontuberculous mycobacteria infections, Emerg Infect Dis, 2010;16:1576–83. 26. 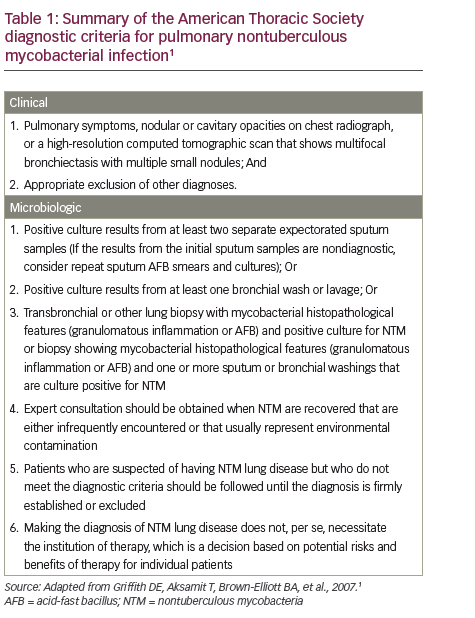 Aksamit TR, Philley JV, Griffith DE, Nontuberculous mycobacterial (NTM) lung disease: the top ten essentials, Respir Med, 2014;108:417–25. 27. Winthrop KL, Chang E, Yamashita S, et al., Nontuberculous mycobacteria infections and anti-tumor necrosis factor-alpha therapy, Emerg Infect Dis, 2009;15:1556–61. 28. Dorman SE, Holland SM, Interferon-gamma and interleukin-12 pathway defects and human disease, Cytokine Growth Factor Rev, 2000;11:321–33. 29. Field SK, Fisher D, Cowie RL, Mycobacterium avium complex pulmonary disease in patients without HIV infection, Chest, 2004;126:566–81. 30. 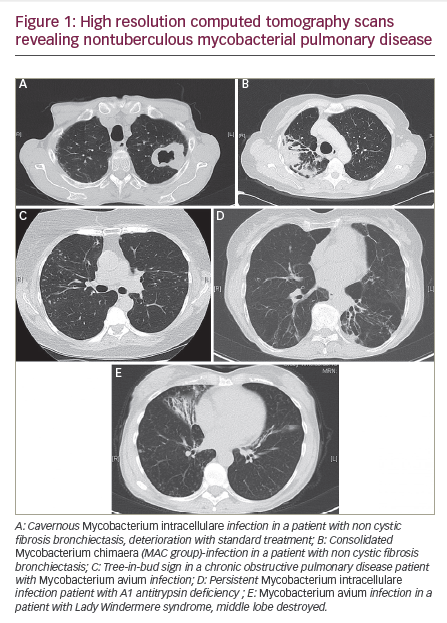 Szymanski EP, Leung JM, Fowler CJ, et al., Pulmonary nontuberculous mycobacterial infection. A multisystem, multigenic disease, Am J Respir Crit Care Med, 2015;192:618–28. 31. Morimoto K, Iwai K, Ohmori M, et al., [Nontuberculous mycobacteriosis mortality in Japan] Article in Japanese, Kekkaku, 2011;86:547–52. 32. Chou MP, Clements AC, Thomson RM, A spatial epidemiological analysis of nontuberculous mycobacterial infections in Queensland, Australia, BMC Infect Dis, 2014;14:279. 33. Andrejak C, Thomsen VO, Johansen IS, et al., Nontuberculous pulmonary mycobacteriosis in Denmark: incidence and prognostic factors, Am J Respir Crit Care Med, 2010;181:514–21. 34. Jenkins PA, Campbell IA, Banks J, et al., Clarithromycin vs ciprofloxacin as adjuncts to rifampicin and ethambutol in treating opportunist mycobacterial lung diseases and an assessment of Mycobacterium vaccae immunotherapy, Thorax, 2008;63:627–34. 35. Ito Y, Hirai T, Maekawa K, et al., Predictors of 5-year mortality in pulmonary Mycobacterium avium-intracellulare complex disease, Int J Tuberc Lung Dis, 2012;16:408–14. 36. Winthrop KL, McNelley E, Kendall B, et al., Pulmonary nontuberculous mycobacterial disease prevalence and clinical features: an emerging public health disease, Am J Respir Crit Care Med, 2010;182:977–82. 37. Hayashi M, Takayanagi N, Kanauchi T, et al., Prognostic factors of 634 HIV-negative patients with Mycobacterium avium complex lung disease, Am J Respir Crit Care Med, 2012;185:575–83. 38. Kitada S, Uenami T, Yoshimura K, et al., Long-term radiographic outcome of nodular bronchiectatic Mycobacterium avium complex pulmonary disease, Int J Tuberc Lung Dis, 2012;16:660–4. 39. Zoumot Z, Boutou AK, Gill SS, et al., Mycobacterium avium complex infection in non-cystic fibrosis bronchiectasis, Respirology, 2014;19:714–22. 40. Gommans EP, Even P, Linssen CF, et al., Risk factors for mortality in patients with pulmonary infections with non-tuberculous mycobacteria: a retrospective cohort study, Respir Med, 2015;109:137–45. 41. Koh WJ, Yu CM, Suh GY, et al., Pulmonary TB and NTM lung disease: comparison of characteristics in patients with AFB smear-positive sputum, Int J Tuberc Lung Dis, 2006;10:1001–7. 42. Schonfeld N, Haas W, Richter E, et al., Recommendations for diagnosis and treatment of nontuberculous mycobacterioses of the German Central Committee against tuberculosis and the German Respiratory Society, Pneumologie, 2013;67:605–33. 43. Jeon K, Kwon OJ, Lee NY, et al., Antibiotic treatment of Mycobacterium abscessus lung disease: a retrospective analysis of 65 patients, Am J Respir Crit Care Med, 2009;180:896–902. 44. Griffith DE, The talking Mycobacterium abscessus blues, Clin Infectious Dis, 2011;52:572–4. 45. Nash KA, Brown-Elliott BA, Wallace RJ Jr. A novel gene, erm(41), confers inducible macrolide resistance to clinical isolates of Mycobacterium abscessus but is absent from Mycobacterium chelonae, Antimicrob Agents Chemother, 2009;53:1367–76. 46. Egelund EF, Fennelly KP, Peloquin CA, Medications and monitoring in nontuberculous mycobacteria infections, Clin Chest Med, 2015;36:55–66. 47. Mangoni AA, Jackson SH, Age-related changes in pharmacokinetics and pharmacodynamics: basic principles and practical applications, Br J Clin Pharmacol, 2004;57:6–14. 48. Adjemian J, Prevots DR, Gallagher J, et al., Lack of adherence to evidence-based treatment guidelines for nontuberculous mycobacterial lung disease, Ann Am Thorac Soc, 2014;11:9–16. 49. Kendall BA, Winthrop KL, Update on the epidemiology of pulmonary nontuberculous mycobacterial infections, Semin Respir Crit Care Med, 2013;34:87–94. 50. Westphal JF. Macrolide - induced clinically relevant drug interactions with cytochrome P-450A (CYP) 3A4: an update focused on clarithromycin, azithromycin and dirithromycin, Br J Clin Pharmacol, 2000;50:285–95. 51. Delavenne X, Ollier E, Basset T, et al., A semi-mechanistic absorption model to evaluate drug-drug interaction with dabigatran: application with clarithromycin, Br J Clin Pharmacol, 2013;76:107–13. 52. Baciewicz AM, Chrisman CR, Finch CK, Self TH, Update on rifampin, rifabutin, and rifapentine drug interactions, Curr Med Res Opin, 2013;29:1–12. 53. Davey PG, Overview of drug interactions with the quinolones, J Antimicrob Chemother, 1988;22 Suppl C:97–107.